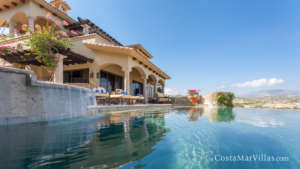 Villa Blue Agave is a breathtaking private rental situated in one of Los Cabos’s most prestigious private communities. 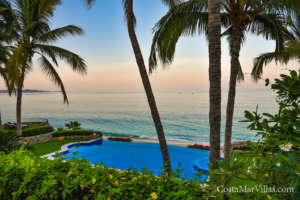 It offers unforgettable views of Palmilla Beach and the Sea of Cortez along with a fine mix of modern amenities and traditional warmth. 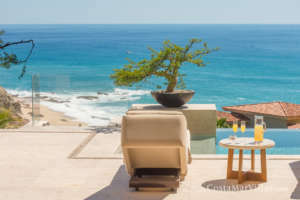 The villa’s stylish, welcoming atmosphere makes it the perfect home base for a memorable trip to Los Cabos. The villa’s beautiful terrace, with fire pits, jacuzzi, saltwater swimming pool, barbecue, and dining areas is the perfect place to start. Comfy lounge chairs and a pinpoint-clear stereo system invite you to sit down, start relaxing, and gaze out over the Sea of Cortez. The inside of the villa certainly does not disappoint! All of the floors are quality natural stone. Counters are beautiful granite, and the walls of the villa are amply stocked with attractive artwork. Every pain has been taken to make the Blue Agave into your ideal vacation oasis. A private bath adjoins each of the villa’s luxurious bedrooms, and the master suite is further embellished with a spa-quality jacuzzi tub. The villa has its own fully-appointed home theater, a smart home system, and a wine fridge. If you’d like to make your stay even more memorable with top-quality professional services, on-demand service from expert chefs and masseurs is available. The villa’s central location puts all of the region’s best attractions – beaches, water sports, golf courses, and so much more – within easy driving distance.